Long-serving Foundation faculty advisor retires | Command and General Staff College Foundation, Inc.
Wilburn E. “Bud” Meador, Jr., a long-serving assistant professor in the Department of Military History at the U.S. Army Command and General Staff College, was honored by colleagues and friends at a retirement luncheon on Jan. 24, 2019, at the Frontier Conference Center on Fort Leavenworth. Col. Rob Ault, left, director of the Command and General Staff School, and Col. (Ret.) 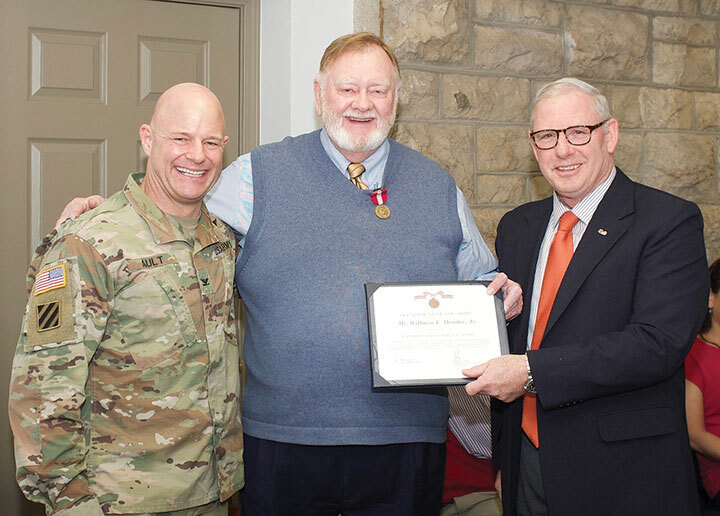 Dave Cotter, the director of the Military History Department, present Bud Meador with the Army Superior Civilian Service Award during Meador’s retirement luncheon Jan 24 at the Frontier Conference Center on Fort Leavenworth. Col. (Ret.) 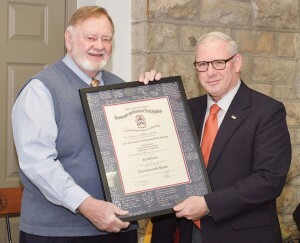 Dave Cotter, the director of the Military History Department, presents Bud Meador with the traditional framed Fort Leavenworth Lamp certificate signed by his College staff and faculty colleagues. Bud Meador doing what he does best – holding court with an audience. 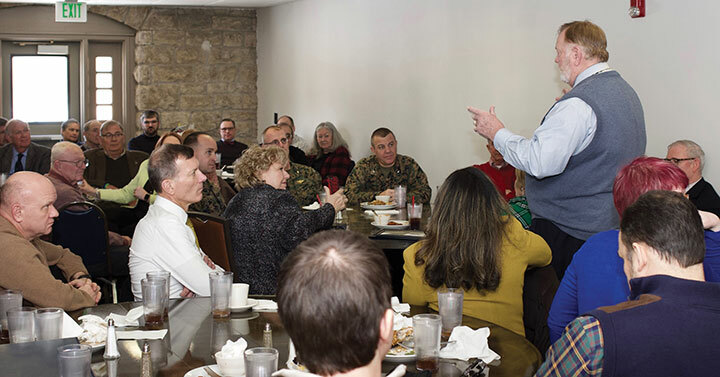 Meador went around the room full of attendees thanking them by name during his retirement luncheon on Jan. 24. 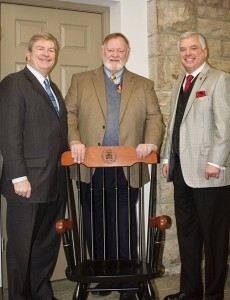 Foundation Chairman Mike Hockley, left, and Foundation President/CEO Rod Cox, right, presented Meador with a College chair for his service at the College and his role with the Foundation during Meador’s retirement luncheon Jan. 24. Meador, a retired Marine lieutenant colonel, served from August 2004 to January 2019 at the College. He and his wife Jane have plans to move to Arizona to start the next chapter of their lives. Col. (Ret.) 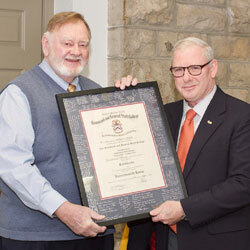 Dave Cotter, the director of the Military History Department, led the ceremony in which Meador was recognized with the Department of the Army Superior Civilian Service Award presented by Col. Rob Ault. Cotter also presented Meador with his retirement certificate, as well as the traditional framed Fort Leavenworth Lamp certificate signed by his College staff and faculty colleagues. 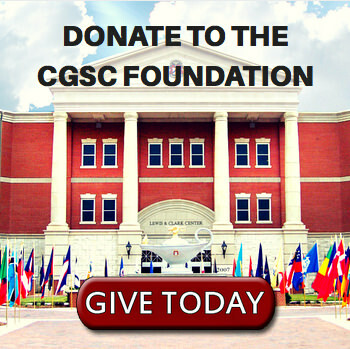 Meador’s retirement is significant for the CGSC Foundation because of his role as the Foundation’s appointed faculty advisor, the only faculty advisor the Foundation has had since its inception in December 2005. Lt. Col. (Ret.) Chris Johnson has assumed the faculty advisor role from Meador. Foundation Chairman Mike Hockley presented Meador with a College chair for his service at the College and his role with the Foundation. As the Civilian Aide to the Secretary of the Army, Hockley also presented him with his CASA challenge coin. infantry training at Camp Pendleton, Calif., Meador was assigned to Marine Security Guard Battalion at the American Embassy in Saigon, Viet Nam, from Jan. 12, 1967 to Jan. 24, 1969. During this tour, he was part of the defense of the embassy, ultimately serving as one of eight Marines on the personal security unit of the ambassador during the Tet Offensive on Jan. 31, 1968. After serving a four-year enlistment, Meador attended Arizona State University and returned back to the Marine Corps as a commissioned officer in 1973. He graduated from The Basic School at Quantico, Va., as an infantry officer. During his service as a Marine Corps officer he served in command and staff positions from rifle platoon commander through assignment as the operations officer for a Marine Expeditionary Force. He also served as a Marine officer instructor at the University of Southern California, as a faculty advisor and on the staff of the Marine Corps Command and Staff College and Marine Corps University at Quantico. He retired from active duty as a lieutenant colonel in February 1996. 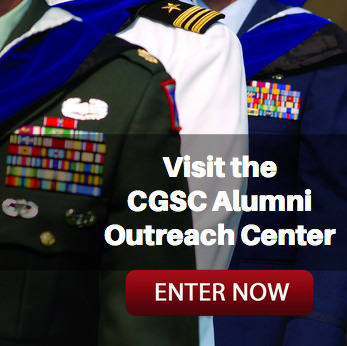 In 2004, he joined the faculty at the U.S. Command and General Staff College. Meador holds a bachelor’s degree from Arizona State University and a master’s from National University. Visit the Command and General Staff College Foundation album on Flickr for more photos from the luncheon.